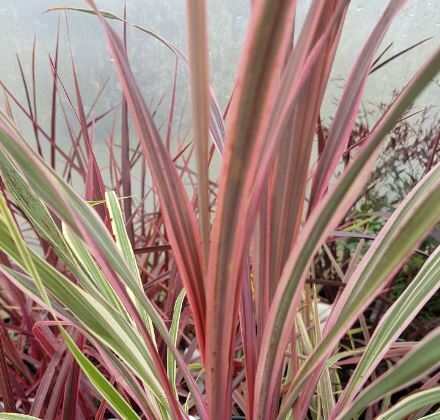 Rosettes of deep red, pink edged sword-like leaves grow slowly to form palm like bushes. An excellent plant for containers and as a focal point. Prefers a sunny sheltered site. Height 60-90cm (2-3′). Good for coastal planting. Tightly packed rosettes of deep reddish purple, pink edged sword-like leaves slowly grow to form eventually a palm-like shrub or small tree. As the leaves age they become more cream and green giving a lovely two tone effect. Prefers a sunny sheltered site. Height 60-90cm (2-3′).